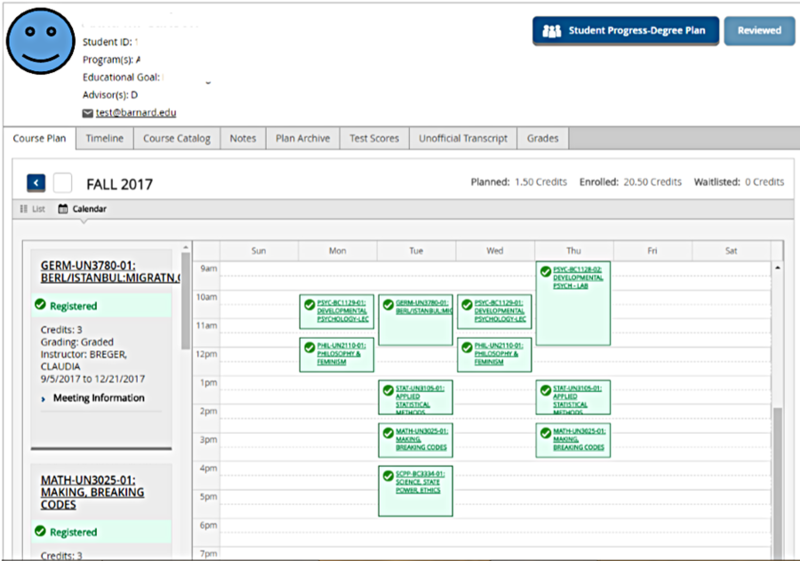 As we mentioned last week, we are launching an updated version of Student Planning this weekend that will give you more of the features you have requested to assist in your advising and teaching. This is the first in a series of updates to Student Planning that will be installed over the next year. This current update will be launched on Saturday, Oct. 28, beginning at 8 a.m., and should be completed during the afternoon of Sunday, Oct. 29. Please do not try to access Student Planning or WebAdvisor during this window - this includes the "email advisees" and "grant permission to register" functions. Over the next few issues of INSIGHTS, we will be explaining these changes with updated screenshots. We are also updating the Instruction Manual for Advising & Registration that is available on myBarnard and will let you know when it's completed. Today, we're providing an overview of the new access to the Course Catalog and improvements that have been made to the calendar function when viewing your Advisees’ planned or registered schedules. GradTalk: Pathway to the Ph.D.